For more on the B-Brigade, check out the full the communique at Visual Resistance and more on the street party at the DCist. (compatible with quicktime 6 and higher). BORF’s Riot Trike, developed with the assistance of the Graffiti Research Lab A/V club, is designed to be a mobile platform for projection and audio bombing. Use the following instructions to assemble your own. Look for these at eBay, Craig’s list or your local used bike store or junkyard. You could also use a bike cart. Or build your own using this sweet open source design. 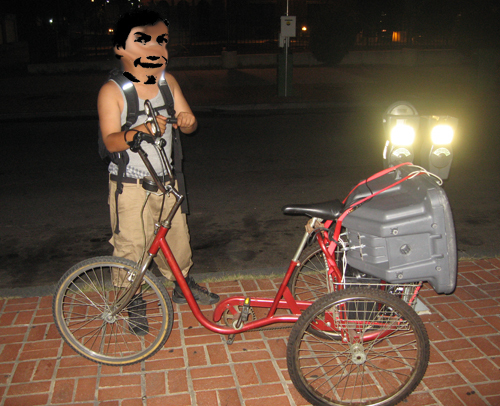 BORF’s Trike used 1 JBL EON GS powered speaker. These cost $400 retail. But you can find them on eBay and at used guitar shops for as low as $250. You can also just bring your stereo system from home. We used two deep cycle batteries are ideal for powering mobile video projection and audio system. 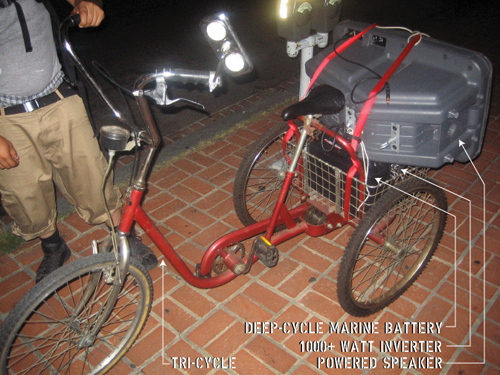 A 90 ah deep cycle battery will run a 250 watt audio system over 3 hours. These batteries can be found at your local boat store on the cheap at eBay. A power inverter converts the power from the DC battery to AC power so you can run AC appliances like your home stereo system or an electric knife in the street. Inverters can be found a audio parts stores for around $100-$150 bucks. You will need to connect the deep cycle battery positive and negative terminal to the DC/AV Inverter positive and negative terminals. Then you can plug the AC powered audio hardware into the inverter. Plug your audio source: a laptop, ipod, cd player, etc. into your powered speakers, stereo aux input on your stereo or similar. Depending on the type or speakers and the audio source, you will probably need an adapter or special cord from radio shack. For more detailed information on setting up mobile audio and video tanks check out the GRL Projection Bombing tutorial.